There are so many resources on the internet these days that it’s impossible to keep up with them all, or even be aware of them all. Some of these resources and free tools are better than others. Alexa is one of these free resources. It uses its own toolbar to gather data on all the websites that its toolbar users visit. It then uses that data to give each website a traffic ranking. No.1 being the site with the most traffic. Now don’t get me wrong. Alexa isn’t the most reliable when it comes to giving accurate stats. One of my sites has an Alexa ranking of 89,000 ish and in Alexa terms that is pretty good, BUT the site doesn’t get thousands of visitors per day. In fact I get more traffic through a site that has a ranking of about 2,000,000 than I do the 89k site. I think it takes page views into consideration more than it does visitors. Anyway, to keep on track with this post, Alexa has other features and offers other statistics as well as visitis and page views. One particularly good feature is the ‘Keywords’ feature. It allows you to see what ANY websites top keywords are AND it is pretty accurate. This is how you can find out what keywords your competitors are getting most of there traffic from. Simply go to www.alexa.com. Then click on the top near the top that says ‘Site Info’. You will now see a row of light grey tabs. Click the one that says ‘Keywords’. If Alexa has enough stats on the site it will display a list of that sites top keywords. It even gives you an ‘Adwords’ style bar graph to compare the keywords. There are various ways in which you can use this information. If you think outside the box you’ll be able to uncover all kinds of high traffic keywords. Some of which will be related to hot niches and will be relatively easy to target if you move quickly. 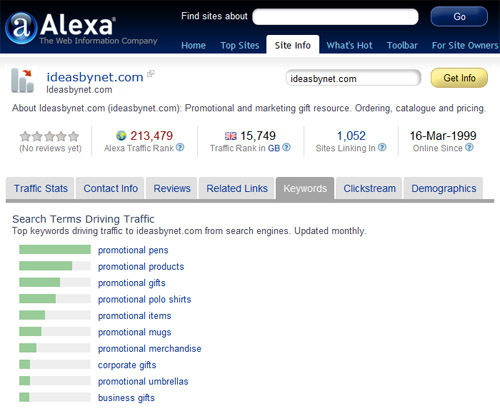 Very cool post, i never realized that Alexa offered that option to look at keywords. In fact i never gave much thought to even using alexa for anything other then checking my rankings. You just revealed a brilliant secret about Alexa, best known for ranking sites. Many thanks for sharing a resource which can help us cut through the clutter of finding the “right” juice producing keywords. Hey, great tool! Definitely will help in knowing which keywords to mention in my articles. This is very useful info to know. We even can compare Alexa and Google keyword data to make it more accurate. I just recently learned about this feature after snooping around their site. When applied, there are tremendous opportunities for competitive intelligence. Bravo on your post Andy! Thanks for this tip Andy. This is good info. So this is what you should use Alexa for. For more accurate visitors counts I nowadays use Quantcast instead of Alexa. A BIG thanx for this info Andy..! keep it up cheers..! Thanks you for this tip. this is really nice info about alexa.